This is a Chinese name; the family name is Chu. Paul Chu, JP (traditional Chinese: 朱經武; simplified Chinese: 朱经武; pinyin: Zhū Jīngwǔ; Wade–Giles: Chu Ching-Wu; born February 12, 1941) is a Chinese-born American physicist specializing in superconductivity, magnetism, and dielectrics. He is a Professor of physics and T.L.L. Temple Chair of Science in the Physics Department at the University of Houston College of Natural Sciences and Mathematics. He was the President of the Hong Kong University of Science and Technology from 2001 to 2009. In 1987 he was one of the first scientists to demonstrate high-temperature superconductivity. Born in Changsha, Hunan, Chu's family was from Taishan, Guangdong Province. He spent his childhood in Taiwan and received his Bachelor of Science degree from Taiwan Provincial Cheng Kung University in Taiwan in 1962. He earned his Master of Science degree from Fordham University in 1965. He completed his Ph.D. degree at the University of California at San Diego in 1968. After two years of performing industrial research with Bell Laboratories at Murray Hill, New Jersey, Chu was appointed Assistant Professor of Physics at Cleveland State University in 1970. He was subsequently promoted to Associate Professor and Professor of Physics in 1973 and 1975, respectively. He took up an appointment as Professor of Physics at the University of Houston in 1979, which he still holds. In 1987 he and Maw-Kuen Wu announced the historic discovery of superconductivity above 77 K in YBCO, touching off a frenzy of scientific excitement exemplified by the Woodstock of physics, at which he was a featured presenter. He was then appointed the Director of the Texas Center for Superconductivity. He has served as the T.L.L. Temple Chair of Science at the same university since 1987. He also has served as a consultant and visiting staff member at Bell Laboratories, Los Alamos Scientific Laboratory, the Marshall Space Flight Center, Argonne National Laboratory, and DuPont at various times. Chu has received numerous awards and honors for his outstanding work in superconductivity, including the National Medal of Science and the Comstock Prize in Physics in 1988, and the American Physical Society's International Prize for New Materials. He was an invited contributor to the White House National Millennium Time Capsule at the National Archives in 2000 and was selected the Best Researcher in the U.S. by US News and World Report in 1990. 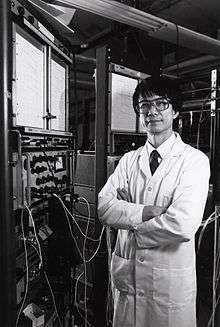 In 1989, Chu was elected a Fellow of the American Academy of Arts and Sciences. He is a member of the National Academy of Sciences, Chinese Academy of Sciences (foreign member), Academia Sinica, Russian Academy of Engineering (RAE) and the Third World Academy of Sciences. His research activities extend beyond superconductivity to magnetism and dielectrics. He succeeded Professor Chia-Wei Woo as the President of The Hong Kong University of Science and Technology on 1 July 2001. President Chu's tenure as University President ended officially on 1 September 2009. ↑ Chang, Kenneth (March 6, 2007). "Physicists Remember When Superconductors Were Hot". New York Times. Retrieved 22 August 2013. ↑ M. K. Wu; J. R. Ashburn; C. J. Torng; P. H. Hor; R. L. Meng; L. Gao; Z. J. Huang; Y. Q. Wang; C. W. Chu (1987). "SUPERCONDUCTIVITY AT 93-K IN A NEW MIXED-PHASE Y-BA-CU-O COMPOUND SYSTEM AT AMBIENT PRESSURE". Phys. Rev. Lett. 58 (9): 908–910. Bibcode:1987PhRvL..58..908W. doi:10.1103/PhysRevLett.58.908. PMID 10035069. ↑ "Book of Members, 1780–2010: Chapter C" (PDF). American Academy of Arts and Sciences. Retrieved June 8, 2011. Wikimedia Commons has media related to Chu Ching-wu.